If you're a small business, we salute you. Small enterprises are the engine of our economy, generating innovation, employment and wealth, so your security matters. This guide shows how you can reduce your risks at an affordable price. Data breaches are bad for business, so every enterprise needs security. In the past this was expensive, because security products were designed for companies with deep pockets and teams of experts. But that's changed. New 'cloud based' services, such as those offered by Qualys, are fast to deploy, safe and easy to use. What's more they're even more affordable. 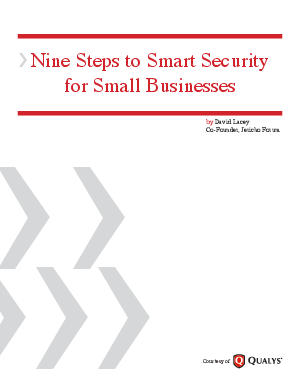 With growing demands from customers and regulators for security, now is a good time to invest in security. Leading cloud-based security services deliver a professional level of security assurance in a form that fits the circumstances and pockets of small businesses.